The casual observer might wonder, “Why is WhiteStar building Lot, Tract and Quarter-Quarter data in California? The BLM already has it all, and for free.” Great question. Maintained and curated data enable data scientists to perform their analytical duties instead of spending valuable time solving data integrity issues. None of the Public Land Survey System (PLSS) data exist in a combined, quality checked or coordinated geodatabase until now. Unfortunately, government agencies don’t communicate well enough among each other - or even have staff to do so - despite memorandum of understanding agreements. Duplication of data at various quality levels and vintages abounds. Which one is correct? Grabbing one arbitrarily makes a 1,000 foot difference. Without knowing the collection and geoprocessing history, it could be the BLM, USGS, Forest Service or none of the above. Sometimes the US Forest Service is right. In areas where they manage lands, they’re actually an expert source. Attribute errors and discrepancies between the digital data and source documents exist within the BLM data, reflecting the reality of budgetary constraints and consequent lack of QA/QC. In the California Department of Oil and Gas (CADOG) data, the PLSS is extrapolated into areas where it has no legal standing. The US Forest Service has created their own data set, and many counties also have custom coordinate files. Source image CA21_17s29e_DR.07.05.1985.SID with WhiteStar TOWNSHIP and SECTION feature class AND BLM_PLSSPoint_40_or_under_LL27 (qualifying points) overlays – 1985 Dependent Resurvey shows acreage for LOT 7 as 48.26. We began our project digitizing the US Geological Survey (USGS) 1:24,000 scale maps in the 1990s as it was (and in many cases still is) the industry respected source. The US Forest Service developed a second version to manage their lands. In recent years, the USGS began using BLM data on their new DRG maps in the past several years via an interagency MOU. Finally, the California Department of Oil, Gas and Geothermal (CADOG) created its own version of the PLSS to fill the “holes” that are actually legally valid land grant boundaries or voids left by cancelled surveys. The land grant boundaries themselves are to be found on the USGS 1:24,000 scale Digital Raster Graphic (DRG) topographic maps. No one source has it all, and no one source has it all completely or even properly digitized. In recent years, the BLM has produced the Cadastral component of the National Spatial Data Infrastructure (CAD_NSDI) dataset for California (to replace an old NGDB version - various versions still floating around) that has some subsection lot and tract data. Many of the corner points are marked with reliability and accuracies ranging from a few feet to (uselessly) many thousands of feet. Individual county surveyors have yet different digital data sets of corner coordinates known to very high resolution. We evaluate, integrate, maintain and attribute the various data sources to provide best-of-breed. 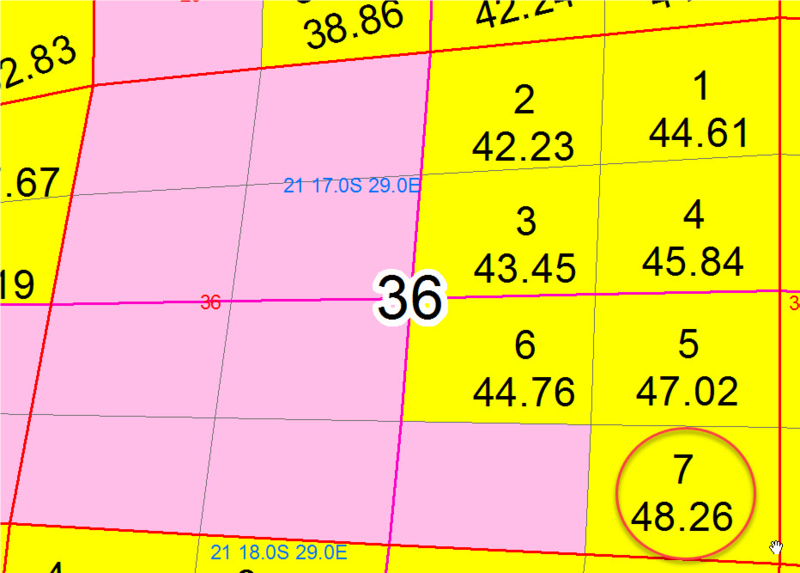 Each section polygon is tagged with an attribute or geometry update date and its source organization (i.e. WhiteStar, BLM, Forest Service, Other). We also provide metadata about the different approaches used in different areas in the vast state of California. The reality of California Land Survey is complex, and resolutions to the challenges have taken many years to solve, and we will be continuously updating subscribers with enhanced data.